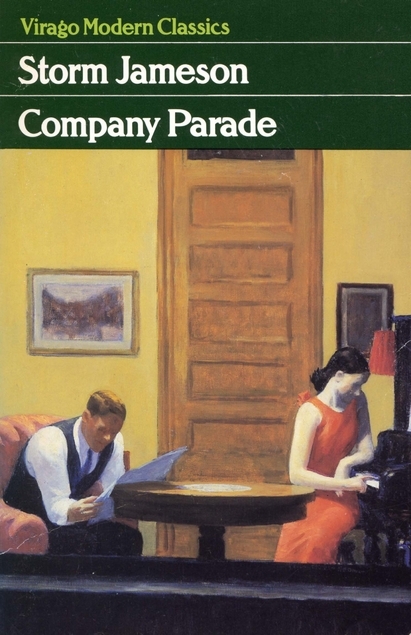 Company Parade by Storm Jameson was first published in 1934 but my copy is a Virago reprint from 1982. The setting is mainly London 1919 where Hervey Russell a young ambitious author has gone to further her career. Her novel is due to be published soon but she takes a job in an advertising agency to keep body and soul together. Life is tough as she is married with a feckless husband called Penn who is in the RAF. He has had a very cushy war unlike most and doesn’t want to give up his safe life in uniform. He spends all of his wages on himself despite the fact that he and Hervey have a small son. Penn isn’t interested in either of them. Hervey has farmed their son out and left him with a woman who lives in Yorkshire, near Hervey’s mother, she’s torn by that decision but knows that she has to be in London. Hervey’s grandmother is fabulously wealthy but a silly family rift means that Hervey has no relationship with her granny. This book is peopled by awkward characters, many of whom have been damaged physically and mentally by World War 1. I think this book, which is the first in a series was probably simmering away in the author’s mind since the end of that war. The book was slow to get going for me but I ended up really enjoying it so I’ll be reading the rest of the series to see what happens next. Storm Jameson was so observant on human character and relationships. However it was her comments on politics and the likelihood of another war being the result of the armistice terms that seemed so prescient to me. I wonder if people really did think like that at the time, she obviously had an eye on what was going on in Germany in the 1930s. She was politically active on the left and was a friend of Vera Brittain, they had both lost brothers in the war. This book seems to be very autobiographical. The Virago cover is a detail from ‘Room in New York’ by Edward Hopper. This entry was posted in Books and tagged Company Parade, Storm Jameson, Virago Modern Classic, World War 1 fiction by Katrina. Bookmark the permalink. This does sound very interesting, Katrina. I look forward to hearing what you think of the rest of the series. I’m just going to have to get the other books from the internet as it could be years before they pop up in a secondhand bookshop. I have never read this author. It does sound very good. I love the cover. I didn’t comment on your previous post about the castle but I greatly enjoyed it. I love being able to see a bit of your part of the world. I’m glad you enjoyed the castle post but I don’t expect people to comment on everything. I also love seeing your bits of countryside when you have a family day out. Trite, but I love Edward Hopper. I think I have a book by this author, but I can’t find it. I think this Hopper cover is very apt as the couple in the book were married – but not really together, something that Hopper seems to have been good at portraying.